Welcome to phatIO - a different way of interfacing a computer with the world. When plugged into a computer’s USB port, phatIO (pronounced “fat-eye-oh”) appears as a USB filesystem/memory stick. You can control devices connected to phatIO by writing to files on the filesystem. Any computer that can write to a USB memory stick and any program/language that can write to a file can talk to phatIO and control things. phatIO significantly reduces the effort needed to control things with a computer - no drivers have to be installed or low level libraries used. Plug phatIO into any computer and just about any program can start controlling the world with little (or no) programming. Display fields from Excel on an illuminiated LED display, sound a buzzer, wake up your computer when movement is detected or raise a flag when you get an email. phatIO aims to help you complete projects in hours rather than days. Write text and numbers to LED and LCD displays by writing the contents to a file - save “hello world” to a file on phatIO for it to be shown on a display. 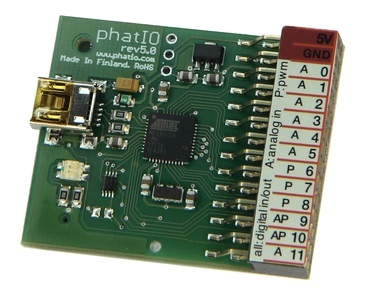 On this website you can purchase a phatIO device, read the Ideas section for a (currently small but growing) number of example projects - most of these can be repeated by just copying the config to phatIO’s filesystem. The Guide gives technical details of the current functionality. The phatIO firmware is being actively updated with new features being added regularly - existing phatIO devices can be upgraded by copying an updated version to phatIO’s filesystem. Subscribe to the blog or Twitter feeds to be kept informed of progress.